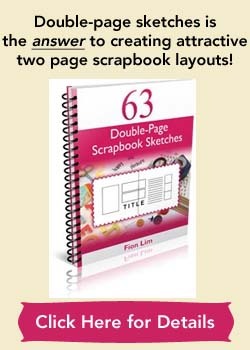 This scrapbooking idea is to do up a layout about a chance you took on. In everyday living, there’ll be many opportunities that come and go. Some we recognize and seize them, letting us experience something bigger than real life and opening doors to places we might never thought of entering. Other times, opportunities are masked as work and we might not recognize them and let them go. Each time, we take a chance, we risk, we stretch ourselves. If we manage to conquer our fears and go for the experience, we usually come out of the other end, more confident and believing more in our own abilities. What chances have you taken recently? Did you take a chance and volunteer yourself for a role you normally wouldn’t take on? Did you grab the chance to perform a service or give a speech when the opportunity presented itself? Scrapbook about them as they sure deserve a place in your album. For me, I’ve never been an emcee for a big group. I’ve only been an emcee twice for small home events involving only 20 odd people. When I was presented with an opportunity to be an English emcee for a 100-people event, I took a breath and said yes. I knew it to be an opportunity and if I missed this one, I might have not the chance to be one the next time round for the same event. I’m glad I grabbed the chance, as I felt my confidence grew after the event. Thanks goodness I didn’t freak out, I presented whatever I needed to present that afternoon. Although I didn’t go completely without a script, at least I had the courage to face the crowd and move the program along at a good pace with my partner emcee. 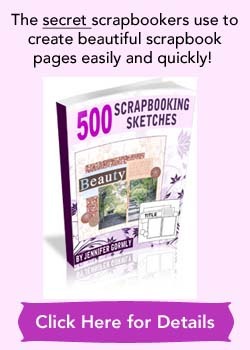 OK, now it’s your chance to scrapbook! Have fun and for more scrapbooking ideas, do browse through this site! Supplies used: Cardstocks – Bazzill Basics; Patterned papers – Basic Grey “Perhaps” Collection; Flowers – Prima Marketing; Brads – KCK Craft; Alphabet stickers – American Crafts “Thickers – Vinyl”; Black pen – Zig Memory System “Millennium”.